CEP's Executive Director Maria Ferguson urges state and local leaders to ignore political chatter and remain focused on college and career ready standards in an Education Week commentary. You can read the commentary here. This report, based on a spring 2016 survey of a nationally representative sample of school district leaders in 42 Common Core-adopting states, explores issues related to assessment. The report highlights district officials’ experiences with administering state Common Core-aligned assessments, how the student achievement data from those exams is used, views on the amount of time that students are tested, and the extent to which students opted out of the 2015 state exams. The Center on Education Policy (CEP) conducted a webinar that highlighted findings from CEP's newest report, Listening to and Learning from Teachers. CEP Executive Director Maria Ferguson and Deputy Executive Director Diane Stark Rentner lead a discussion about teachers' experiences with the Common Core State Standards (CCSS) and aligned assessments, as well as policy recommendations for supporting educators in their work with the Common Core. The report summarizes the results of five focus groups with public elementary school teachers from school districts in Illinois, Delaware, Wisconsin and Utah. A majority of teachers expressed generally positive views about the standards but said more work is needed to make student data from the new assessments more helpful to teachers. The webinar reviewed focus group results and included discussion of how states and districts can support educators in their work with the CCSS and related assessments. Below, you can view the video and download the webinar's PowerPoint presentation. This report summarizes discussions from five elementary teacher focus groups conducted in Delaware, Illinois, Utah, and Wisconsin in spring and summer of 2016. Topics addressed include the Common Core State Standards, curricula, instructional materials, CCSS-aligned state assessments, student achievement data from those assessments, and accountability. Where possible, the teachers’ comments are compared to the findings from CEP’s 2015 teacher survey. The Center on Education Policy (CEP) conducted a webinar that highlighted findings from CEP's newest report, Listening to and Learning from Teachers. You can view and download materials from the webinar here. In the winter of 2015, CEP surveyed a nationally representative sample of public school teachers to learn their views on the teaching profession, state standards and assessments, testing, and teacher evaluations. The report, Listen to Us: Teacher Views and Voices, summarizes these survey findings, including responses indicating that public school teachers are concerned and frustrated with shifting policies, over emphasis on student testing, and their lack of voice in decision-making. Also included below is a ready-to-use comprehensive Power Point presentation of key findings from CEP's Teacher Survey Report, Listen to Us: Teacher Views and Voices. You can listen to the webinar here. Each of the tables and figures that appear in the report have been converted to individual JPEG images. These images may be used without explicit permission from the Center on Education Policy as long as appropriate attribution is given to the CEP as the source. Also, the JPEG images do not include the notes that appeared with each of the tables and figures in the report. Please refer to the report for the notes and to Appendix 2 for information on the confidence intervals. This updated compendium includes over 85 research studies focused on the Common Core State Standards, and encompasses research from multiple sources, such as government entities, independent organizations, and peer-reviewed publications from academic journals and other outlets. Each study in the compendium has been summarized and categorized across nine topic areas. A URL link to the original research is also provided when possible. The compendium is presented below both as a single document as well as individual PDFs of the nine topic areas. The compendium will be updated regularly as the body of CCSS-related research grows. This latest version is updated as of February 10, 2015. This report, based on a survey of a nationally representative sample of school districts located in Common Core-adopting states that are also members of the PARCC or Smarter Balanced testing consortium, examines school districts’ efforts to prepare for the consortia assessments. The report discusses district leaders’ views on the consortia assessments, plans to provide remediation and support for students who may need assistance, readiness for administering the assessment online, and plans for revising or eliminating their own math and English language arts assessments. This report, based on a survey of a nationally representative sample of school districts in Common Core-adopting states, examines school districts’ efforts to develop and implement CCSS-aligned curricula and to provide professional development to teachers and principals. Specifically, the report examines anticipated timelines for implementing CCSS-aligned curricula in all schools, sources of CCSS-aligned curricula, the estimated percentages of teachers and principals who have participated in CCSS-related professional development, anticipated timelines for when all teachers and principals will be prepared for the CCSS, and providers and topics of CCSS-related professional development. This report, based on a survey of a nationally representative sample of school districts in Common Core-adopting states, examines school districts’ efforts to implement the Common Core State Standards (CCSS). The report addresses district leaders’ views on the rigor of the CCSS and their impact on learning and instruction, progress on and challenges in implementing the standards, outreach efforts to inform various stakeholders about the CCSS, district collaboration with other entities on various implementation activities, and the types and helpfulness of CCSS-related assistance from the state education agency. A Research Agenda for the Common Core State Standards: What Information Do Policymakers Need? As part of a broader project to better connect the research on Common Core State Standards (CCSS) to policy and practice, CEP met with individuals from organizations representing state and local education policymakers to learn of their memberships’ research and data needs around the Common Core. The conversations yielded four areas of policy-related research that will be needed in the coming year: (1) case studies of successful implementation of the CCSS; (2) studies of state and local CCSS outreach strategies; (3) studies of state education agency capacity to lead the CCSS implementation; and (4) analyses of the impact of federal education requirements on CCSS implementation. This October 2013 blog, written by CEP deputy director Diane Stark Rentner for the Hunt Institute’s Intersection, summarizes the major key findings from CEP’s 3013 survey of state education agencies’ on the implementation of the Common Core State Standards. The Center on Education Policy, with generous support from the William and Flora Hewlett Foundation, convened two meetings in 2013 to focus on the need for a more relevant and coordinated research agenda on the Common Core State Standards (CCSS). The idea behind this project was that the research agenda for the CCSS and aligned assessments should be informed not only by the interest areas of leading researchers, but also by the needs of policymakers and practitioners. In order to do that, the traditional roles, relationships, and incentives that have long kept researchers, policymakers, and practitioners huddled within their own silos will need to change. This summary report details the key findings from those meetings and makes recommendations for developing a robust and timely research agenda for the CCSS that informs both policy and practice. On November 4, 2013, the Center on Education Policy at the George Washington University hosted the Education Writers’ Association symposium on the Common Core State Standards. 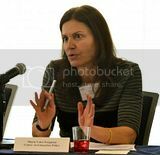 This day-long event brought education writers and reporters from across the country to the GW campus to talk about the most pressing policy, practice, and research concerns related to implementation of the Common Core and the next generation assessments. A series of panel discussions featured some of the leading thinkers in education including CEP’s Maria Ferguson and Diane Stark Rentner, Randi Weingarten (AFT), Marc Tucker (NECC), former Michigan Gov. John Engler, and author Amanda Ripley. For more information, visit EWA’s website: www.ewa.org. This report, based on a spring 2013 survey of state education agency officials in Common Core-adopting states, focuses on state efforts to prepare students with disabilities for the Common Core State Standards. The report also addresses the challenges states face with supporting teachers of students with disabilities and state plans for assessing Common Core mastery for students with disabilities and students with the most significant cognitive disabilities. This report, based on a spring 2013 survey of state education agency officials in Common Core-adopting states, highlights states’ efforts to prepare for the administration of Common Core-aligned assessments, including plans to assess students' mastery of the standards prior to the administration of the state consortia-developed assessments, efforts to prepare teachers to interpret and use the results of the Common Core-aligned tests to improve student learning, and actions to inform parents and other stakeholders about potential lower student pass-rates on the exams. The report also discusses state education officials’ views of certain features of the state consortia-developed assessments. This report, based on spring 2013 survey of state education agency officials in Common Core-adopting states, broadly examines states’ efforts to implement the Common Core. Topic covered include states’ views on the rigor of the standards, timelines for teaching a Common-Core aligned curricula, a discussion of state actions to help schools and districts prepare for the standards, and an assessment of state education agency capacity to implement the Common Core. This report, based on spring 2013 survey of state education agency officials in Common Core-adopting states, provides information on state efforts to prepare teachers and principals. The report examines which entities are providing Common Core related-professional development services within the states, the estimated proportion of teachers and principals that have participated in such services, and the challenges that states face in preparing educators to teach a Common Core-aligned curricula. This report, based on a winter/spring 2013 survey of 40 Common Core State Standards-adopting states, examines state education agency (SEA) officials’ views on the federal role in implementing the standards. The report finds that, although a direct federal role in implementing the Common Core State Standards has been controversial, a majority of states in the survey support legislative and/or regulatory changes to the federal Elementary and Secondary Education Act to help them with their implementation efforts. The report also addresses the issue of within-state opposition to standards and finds that the vast majority of survey states do not anticipate their state’s decision to adopt the standards will be reversed, limited or changed in 2013-14. Reflections on a Half-Century of School Reform: Why Have We Fallen Short and Where Do We Go From Here? Upon his retirement from the leadership of CEP, Jack Jennings reviews in this paper the three major school reform efforts of the last 50 years, proposes an agenda focused on the classroom, and advocates for the creation of a federal civil right to a good education to advance that agenda. This report, based on a fall 2011 survey of 35 Common Core State Standards-adopting states (including the District of Columbia), examines states’ progress in transitioning the new standards. The vast majority of the states in the survey believe that the Common Core State Standards (CCSS) are more rigorous than previous state academic standards in math and English language arts. The vast majority of survey states are taking steps to familiarize state and district officials with the new standards and to align curriculum and assessments. However, most of the states in the survey do not expect to fully implement the standards until 2014-15 or later. In addition, a majority of the responding states caution that having adequate resources is a major challenge to full implementation of the CCSS. Education Writers Association's executive director Caroline Hendrie talks with Diane Stark Rentner of the Center on Education Policy about CEP’s report, Common Core State Standards: Progress and Challenges in School Districts' Implementation, and how school districts are transitioning to the Common Core State Standards. This report, based on a nationally representative sample of school districts, examines school districts’ perceptions and early implementation of the Common Core State Standards (CCSS). The report finds that approximately three-fifths of the districts in states that have adopted the CCSS agree that the new standards in math and English language arts are more rigorous than the ones they are replacing, and a similar proportion of districts expect the CCSS to improve students’ skills in these subjects. The survey results also show that district officials see relatively little resistance to the standards from parents, community members, and local educators, with only 10% of districts in the adopting states considering resistance from teachers and principals to be a major challenge in implementing the standards, and just 5 percent view resistance from parents and community members as a major challenge. However, adequate funding to implement all aspects of the CCSS was viewed as a major challenge by 76% of districts in CCSS-adopting states, and as a minor challenge among 21% of such districts. This September 14, 2011 Huffington Post blog, written by Jack Jennings, discusses the Center on Education Policy Report, Common Core State Standards: Progress and Challenges in School Districts’ Implementation. On May 3, 2011, the Center on Education Policy issued an open letter to the member states of the Partnership for Assessment of Readiness for College and Careers (PARCC) and Smarter Balanced Assessment Consortium (SBAC), which are developing assessments aligned to the Common Core State Standards. The letter, which is based on CEP’s five-year extensive analysis of state testing results, raises some issues regarding the setting of the cut score for proficient performance and the reporting of results. The suggestions are offered in an effort to make the new assessment systems as useful as possible to policymakers, educators, researchers, parents, and the public. Also posted below is the response from SBAC. On January 10, 2011, Jack Jennings, CEP's president, appeared on Washington Journal, a regular program on C-SPAN. The topics discussed included CEP's December 2010 report on the achievement gap, CEP's January 2011 report on common core state standards, the education agenda facing the 112th Congress, and many other issues. On January 10, 2011, Jack Jennings, CEP’s president, appeared on Washington Journal, a regular program on C-SPAN. The topics discussed included CEP’s December 2010 report on the achievement gap, CEP’s January 2011 report on common core state standards, the education agenda facing the 112th Congress, and many other issues. C-SPAN's Washington Journal - January 10, 2011 from Center on Education Policy on Vimeo. In the fall of 2010, the Center on Education Policy surveyed state officials about their efforts to adopt and implement the Common Core State Standards in reading and math. The survey found that states that have adopted the standards have plans for changing policies and programs, such as developing or adopting new assessments, modifying curriculum materials, and offering professional development for teachers, to ensure that the standards are fully implemented at the classroom level. However, many of these changes will not be fully in place until 2013 or later. In the fall of 2009, CEP surveyed state officials about their implementation of the American Recovery and Reinvestment Act, and included in this survey were some questions about the Common Core State Standards (CCSS). We conducted a similar survey of school districts officials in the winter of 2010 and also included some questions on the CCSS. State responses to our CCSS questions can be found on page 3 and in figure 4 on page 9 in the state report. District responses to the CCSS questions can be found on page 15 of the district report. Links to the two reports appear below. The American School Board Journal (September 2009) contains an article on national or common academic standards written by Jack Jennings, CEP’s president.